This release is one of the most feature-packed updates yet. It includes two long-requested features that will transform how OpenVSP is used. There are another half dozen smaller updates that would justify the version number bump on their own. There is something here for everyone — you are going to want to update. Blended wings are finally here. OpenVSP v2 had a BWB component that I was never happy with for many reasons. It is one of the things that didn’t make the cut for v3 because I didn’t want to support an ugly hack forever. There have been two significant attempts at blended wings in the v3 era. The first was based on early skinning and was a total disaster. The second brought us slew control in skinning; while improved, it mostly proved that a skinning-based approach wouldn’t work. 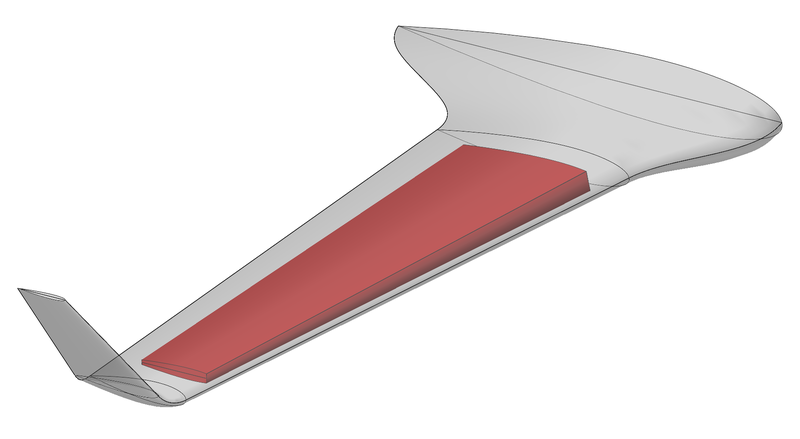 Wing blending works by giving the user enhanced control over the leading and/or trailing edges of a wing section. Instead of a straight line, the LE/TE can become a smoothly varying curve. Through suficient application of magic, the rest of the airfoil follows along. The most simple way to modify a LE/TE is to change its local sweep or dihedral angle. You can also set a LE/TE direction to ‘match’ an adjoining wing section. These options should enable the user to quickly build their design intent into a blended wing with a minimum of parameters. A brief video tutorial on the blended wing component is available to get you started: Blended Wing Tutorial. Conformal components are an entirely new addition to OpenVSP. Where most OpenVSP components’ shape is independently defined, conformal components derive their shape from their parent — they conform to their parent. This makes them ideal for modeling fuel tanks and payload bays. Users will soon find myriad application including layout and mass properties problems. To create a conformal component, select the desired parent component and ‘Add’ a conformal component. Then adjust the offset and U/W trim as desired. Other new features include XPatch export of triangle meshes and SVG export for 2D drawings. CompGeom (and related tools) should be faster in one step. CompGeom now calculates and reports the area of subsurfaces. Lots of little bugs were fixed too — but if you weren’t convinced to update by now, I doubt they’ll do it for you. Just go ahead and update, trust me.